Sophomore Andrew Pilat makes a move. Martinsville High School is known for many different things. Chess, however, is not one you usually hear. On March 23rd, 2019, the National Chess Competition will be held in the MHS gymnasium. 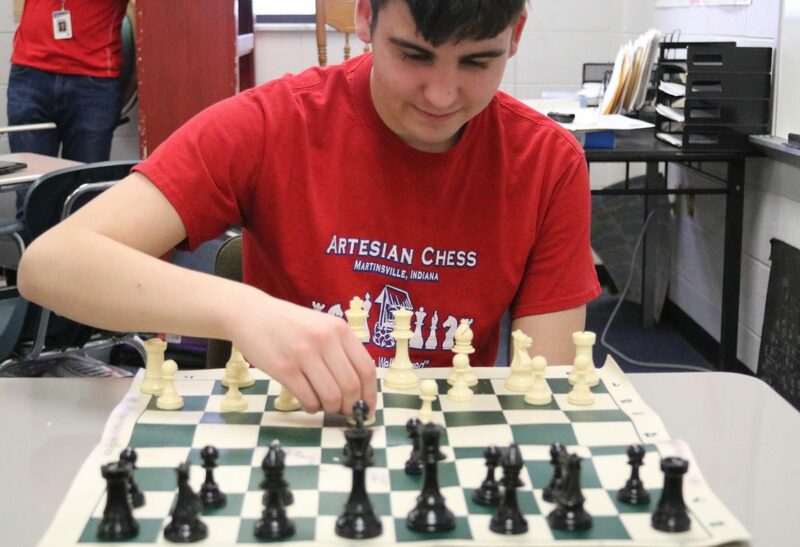 “We currently estimate that there will be around 600 players and 1,200 parents and coaches, but we expect a little more for an average of around 2,000 [people],” said sophomore Andrew Pilat when asked about the competition. All of the students train hard throughout the year to be able to compete in this competition as well as others. They go to many competitions in their own state throughout the year. Chess is a very strategic activity and even just watching a player can make you feel stressed for them. It was extremely difficult to get the tournament to come to Martinsville. It took the whole month of July for Pilat to go around town getting a total of sixteen proposal letters. Pilat filed the proposal in August but did not receive news that the competition would be coming here until the end of fall break in October. It took so long to decide this because Martinsville is the first ever town to request to hold the competition. The students training for chess begins by playing online games or joining clubs to learn how to play. Once they understand the works of the game, they move on to reading strategy manuals and recording their games for review. They do this so that they can watch their mistakes and learn from them so that they do not make them again. The competition will be held from 8 a.m. to 8 p.m. on Saturday, March 23rd at MHS. They will need help on Friday, March 22nd after school for set up, and Sunday, March 24th for tear down. They also need parent and faculty volunteers to help with concessions, as well as students to help lead people around the building. If you are interested, email Andrew Pilat at [email protected], or Brian Pilat at [email protected].